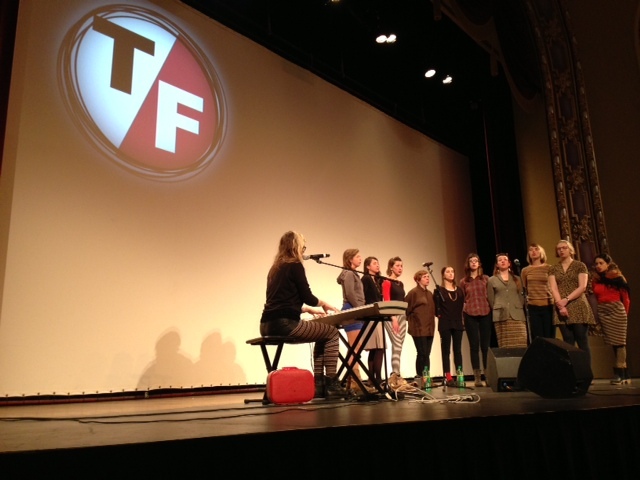 The group "Anonymous Choir" performs before the film "Twenty Feet From Stardom" at the Missouri Theatre. Photo by Lauren Puckett. 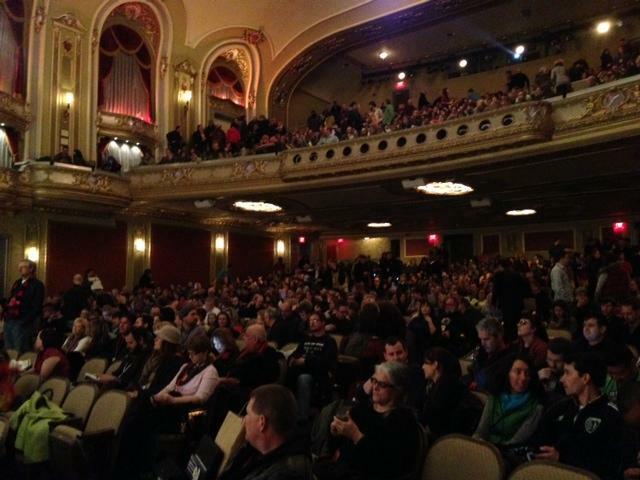 The Missouri Theatre was packed as viewers scrambled in to watch “Twenty Feet From Stardom.” Photo by Lauren Puckett. It’s clear when you look at me that I’m a True/False virgin. First of all, I look lost. I’m turning around in circles, checking my phone and my pass, standing on tip-toes to see over the crowd. I get trapped in a sea of chattering people and have a hard time keeping track of my things. Second, I’m trying too hard. Everyone knows that True/False is where the “hipsters” all go, where they thrive on Kaldi’s and video cameras, where they wrap up in scarves and beanies and nod at the intellectual perspectives of some film director they don’t know. It’s “hipster-topia” out there. So I’m clearly trying to fit in, wearing the “hipsteriest” thing I own: a printed blouse with a lacy Peter Pan collar, a tucked-in tank top, a pair of boots over my jeans, and my painted brown peace sign earrings. Of course, in my desire to conform, I’ve neglected more reasonable articles of clothing – such as regular old gloves to keep my freezing hands warm. So, here I am, standing in the Q line with my hands stuffed in my pockets, humming Ed Sheeran so I feel a bit better about myself. My cheeks are numb and I have an hour until the film starts, but I’m still in the back of a line that wraps around the Missouri Theatre. The queue number slip is shaking in my trembling hands. And my phone is running out of battery. I’m desperately trying to stay positive. I try to distract myself. I gaze around, taking in the overwhelming culture of True/False. I see my fellow journalism friends, skipping about town in blazers and sweaters, camera cases tucked under their arms. I listen to an older woman jabber Spanish behind me, yanking her ear muffs around her Ray Ban sunglasses. I watch the box office volunteers, dressed in red scarves and polka dot pajamas. I make friends with a piano teacher in the Q, who hasn’t been to the festival in two years and seems happy to be home. I take notes about my observations on my phone. My fingers are so cold, I can hardly move my thumbs quick enough. The sensations of Columbia in its prime are hitting me like a whirlwind. I’m racing to keep up. But I’m happy. Is that odd? I’m getting a headache from the insanity of it all, but I’m happy. I settle down in the second row of the Missouri Theatre, glad to be warm again. Indie music wafts through the air, as a group named Anonymous Choir takes the stage. The room is already filled to the brim; you practically have to scream to be heard by anyone. I squeeze between a hipster-looking young man and a hipster-looking old man. The young man is taking his girlfriend on a date; the old man is taking his camera on a spree. He catches me glancing at his pictures. I’ve always been bad at hiding my curiosity. I sheepishly smile at him, expecting him to give me a strange look and put his camera away. Instead, he laughs. He flips back through a few images, landing on one of him with a film director. I grin, pleased to see he isn’t upset with me invading his privacy. “I think it’s a fantastic picture,” I tell him, and I mean it. I’m immediately intrigued. Freelance – that’s potentially my medium. I decide to stretch my inquisitiveness a bit. I marvel for a minute at the truth of this statement. I never really thought of True/False as that special. It’s just a festival that comes into town once a year, crowds up the streets and makes traffic impossible. His eyes grow huge, like he just discovered a new planet or something. He shifts in his chair, getting comfortable for a long conversation. We proceed to talk for the next thirty minutes, about “Crash Reel” and “No,” about “Where’s the Front Line From Here?” and “Twenty Feet From Stardom,” about state boundaries and political manipulation, about war zones and snowboarders, about American brotherhood and Iranian families, about acting and about living. I never learn this guy’s name and he never learns mine. But together we wonder over human existence and the reality that we all share. The lights begin to darken and the movie begins to play. But this hipster-looking old guy says one last thing before we turn away from one another. Then the movie starts. Then the movie ends. Then I drive home in my nice, warm car and eat a chocolate bar before bed. But his last statement stuck with me throughout that whole night, throughout the next day and the evening after. I kept replaying it in my mind, the subtle and simple way he said it. Like it was the plainest and most obvious thought that’d ever come to his mind. If we had any idea what it was like for the rest of the world, we might change. We might stop complaining. We might be compassionate; empathetic. We might understand. And suddenly I realized that’s what the hype and culture of True/False is all about. This film festival, this incredible celebration and examination of life, is about empathy. It’s about exploring the silent voices. It’s about traveling to other worlds and telling those stories. It’s about connecting people who are miles apart. It’s about mixing cultures and introducing ideas all so that maybe, just maybe, we might understand one another. We might understand life. This hipster-looking old man (whose name I never learned) looked and acted completely different from me. He had a triple chin and a giant blue windbreaker. He works in Kansas City and hates his day job. I talked to him for all of thirty minutes. But I think I understood him. And I think he understood me. All the movies I watched connected me to people I’ve never met. And I came home tonight and felt a little different. I appreciated my hot water and safe country a little more. I appreciated the simple pleasures and the words flowing from my fingertips. I’m glad I’m not a True/False virgin anymore.